thus) of James Frey (signed at the launch event of his "The Final Testament of The Holy Bible"). New and unread 1st edn - signed, lined (with a quote from the book) and dated by the author James Frey to the title page. 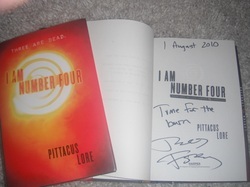 Signed as JAMES FREY and not as Pittacus Lore, and VERY RARE thus. The first in an exciting series, the first of which is already in production as a major motion picture by Dreamworks/Stephen Spielberg. Synopsis : Nine of us came here. We look like you. We talk like you. We live among you. But we are not you. We can do things you dream of doing. We have powers you dream of having. We are stronger and faster than anything you have ever seen. We are the superheroes you worship in movies and comic books¿but we are real. Our plan was to grow, and train, and become strong, and become one, and fight them. But they found us and started hunting us first. Now all of us are running. Spending our lives in shadows, in places where no one would look, blending in. we have lived among you without you knowing. But they know. They caught Number One in Malaysia. Number Two in England. And Number Three in Kenya. They killed them all. I am Number Four. I am next. Synopsis: Nine of us came here. We look like you. We talk like you. We live among you. But we are not you. We can do things you dream of doing. We have powers you dream of having. We are stronger and faster than anything you have ever seen. We are the superheroes you worship in movies and comic books—but we are real.